Lush Lush Bomb Bath Bomb | £3.95 // This bath bomb shares the same scent as Karma and it's one of my favourites. Although the colours of this one are the complete opposite to other Karma scented products, I still like it. I also love the little Lush Kitchen tag on it! Olive Tree Gourmet Soap | £7.50 // This is one of the more expensive gourmet soaps but is one I think will be extremely moisturising. I don't like the taste of olives but have liked other olive scented products in the past so I thought I'd try it. Vanilla Fountain Bath Bomb | £3.75 // This is one of the bath bombs that I would have in my perfect Lush Kitchen menu as I love the simple vanilla scent it has. It isn't one of the good ones to sit and watch but it does leave the water smelling amazing. 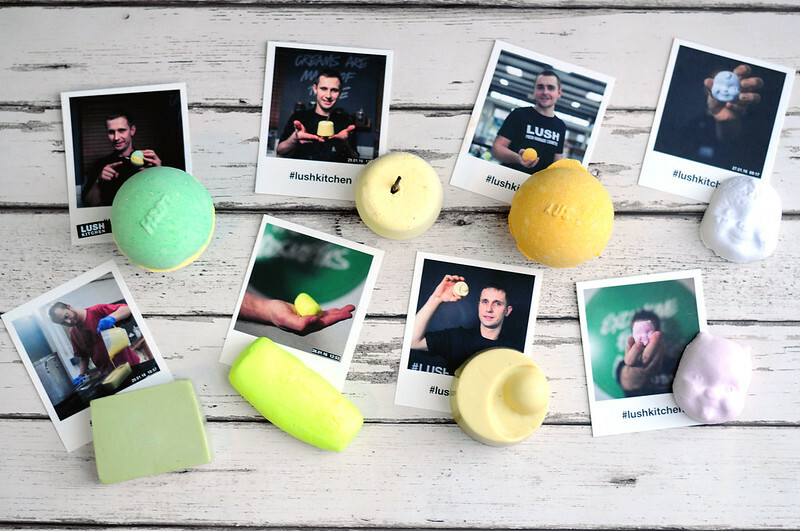 Playdoze Bubble Bar | £3.95 // I've used this bubble bar before when it was available from Lush Retro which I think was the equivalent to the Lush Kitchen, or at least the nearest thing to it. The scent is lavender, fennel and ylang ylang. Golden Slumbers Bath Bomb | £3.95 // The strongest scent of this bath bomb is lavender and I love it. It's one of the bath bombs I try to use as soon as I buy it as I find it doesn't store well and sinks to the bottom of the bath. This is packed full of gold lustre which makes the water look amazing but does mean you have to clean the bath well afterwards. Sleepy Head Massage Bar | £6.50 // I was surprised with the size of this massage bar as it's 90g, about a third bigger than the other bars and not much more expensive. I have to say, I don't love the scent of this one and if I had been able to smell it beforehand then I probably wouldn't have bought it. I will use it and probably enjoy it but I'll use it as a bath melt instead of a body moisturiser. Again it has quite a strong lavender scent but the jojoba oil and ylang ylang are quite prominent scents as well which is the reason I don't like it as much as I fought I would. Ickle Angel Bath Bomb | £2.75 // I was really surprised with just how small this bath bomb is. I know I've tried either this one or the devil one before but I just cannot remember it being so tiny. It is cheaper than the normal sized bath bombs but I just don't think it's cheap enough for the size. I'm glad to have bought one of each but if they come back into the Kitchen again at any point then I won't be buying them again. Ickle Angel smells of sandalwood, lavender and chamomile blue. It's a very relaxing scent! Ickle Devil Bath Bomb | £2.75 // Again this is the same size as the Angel bath bomb and actually smells very similar. I thought it would be different which is a bit disappointing. I'll probably stop by LUSH one of these days again, so thanks the inspiration, hehe.